At KP Vinyl Siding, we believe that color has the power to bring your dream home to life. That’s why we take the time to track design trends, shifts in demographics and their impact on architecture. This upcoming year, color trends reflect the current push towards darker, richer shades. 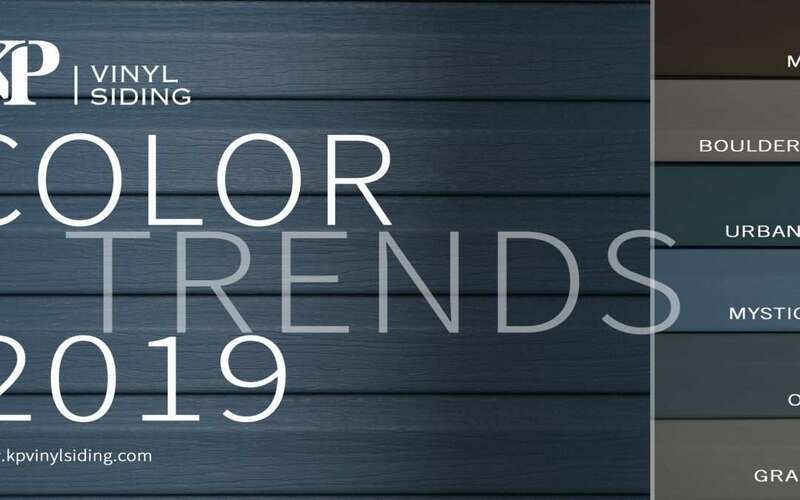 Check out our Color Trends 2019. As strong and clean as stainless steel and as soft as a kitten, Boulder Gray has the hue to fit any home and adds a beautiful accent to all of our other siding and trim color options. This versatile gray gives your home a rock-solid look that stands alone. The deep tones of a business man’s jacket combined with the trendy blues of a cosmopolitan fashionista creates the sophisticated shade of Urban Blue. Tone it back with soft beige or play it up with a spicy red to make your home renovation dreams a reality. On the far end of the color spectrum, Manor hovers between smoky charcoal and pure black for a refreshingly bold look. This rich shade is a true expression of individuality. Tone it up or tone it down depending on your trim and accent colors. Prepare to be the envy of your street. Perhaps it gets its name for the way it calls to mind an endless stretch of ocean or because it’s as enchanting as the sky at twilight, but whatever the case, Mystic Blue is definitely not a fade-into-the-background shade. Make a statement without saying a word. How ironic is it that blue is another word for sad, when blue is one of the most beautiful shades of the rainbow? If you feel happiest sitting by the sea or gazing at the evening sky, side your house in Ocean, our boldest of blues. A deep shade of gray, like a tall tree trunk wrapped in silvery bark or giant rocks smoothed by the ocean’s waves—if you wish to make a true statement, make it with Graphite. Elegant, sophisticated, and strong, watch your curb appeal increase tenfold with this bold, yet classic tone. Rest assured your colors will stay as bold and true as when they first installed on your home. Our commitment to color has led our research and development team to develop SpectraShield™ Technology, allowing homeowners everywhere to “indulge in dark, bold vinyl colors”.